I started on a new project this week which is painting a garage door to look like wood. The project is off to a good start. I will be painting a double garage door and single garage door plus the front door to look like they were all made from the same wood. On Monday I cleaned, primed and applied the base coat of paint. It took all of the first day to clean the doors, prime and base coat them. In the first picture you see how I am using a primer tinted to a medium dark gray. I use the multipurpose primer from Sherwin Williams. In this next picture you can see how the base coat color goes on over the primer. The base color for this garage door is a SW color called Toasty. One reason I wanted to post this picture is so you can see how the primer goes on over the white door. 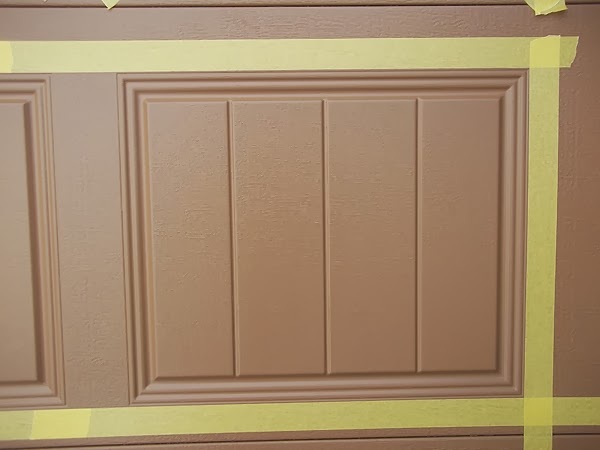 The purpose of the primer is not to give you total coverage over the original white color of the door. The purpose of the primer is to prepare the surface for the top coat of paint. Lifted from Wikipedia : Primer is a paint product that allows finishing paint to adhere much better than if it were to be used alone. For this purpose, primer is designed to adhere to surfaces and to form a binding layer that is better prepared to receive the paint. 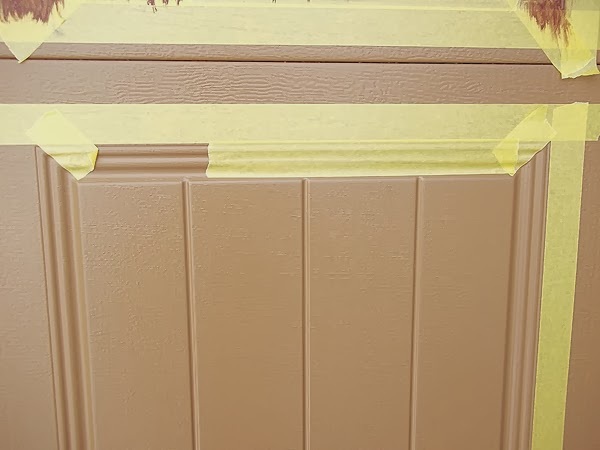 Because primers do not need to be engineered to have durable, finished surfaces, they can instead be engineered to have improved filling and binding properties with the material underneath. 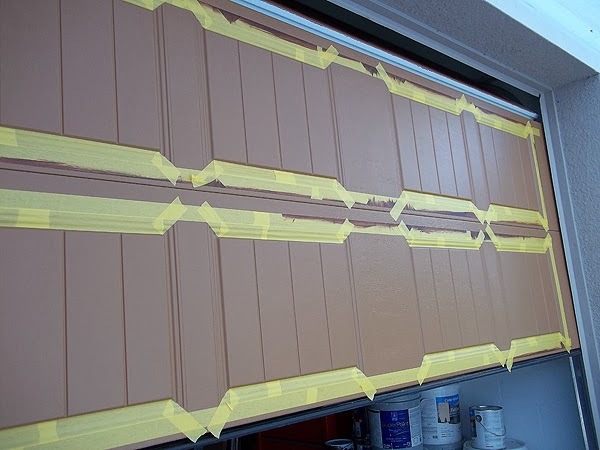 In this next picture you can see how I tape off this particular profile of garage door panel. The panels on these doors have simulated vertical wood planks. 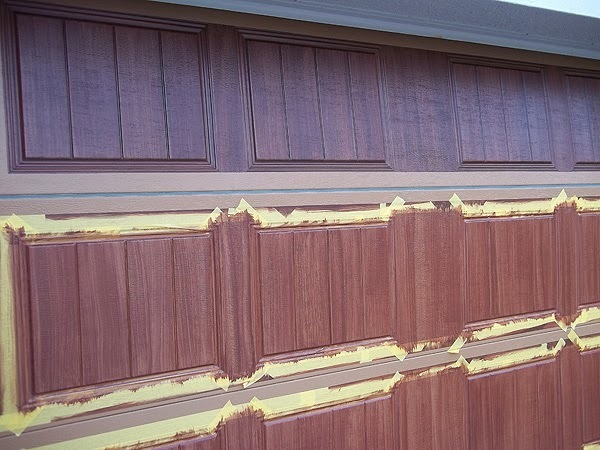 I actually much prefer this look on garage doors to the panels that do not have them. To tape off the panels I start by running a tape line across the top and bottom and each end of all the panels in the row. There are 4 wood planks in each panel. Around the 4 planks there is a nice profile type frame. On the side of the planks I want the grain to go vertical on the framing but on the top and bottom I want the grain to go horizontal. So in order to accomplish this I tape off the upper and lower part of the frame. First I put some tape tabs in each corner. Then I run the tape horizontally across the top of the planks leaving enough of the end of the planks exposed so that the grove between the planks is not covered up. When I paint a garage door to look like wood I typically work on 2 rows at a time. In the next picture you can see I have 2 rows taped off and ready to paint. I have them taped off in this manner so that I can create a vertical grain pattern for each panel and the area between the panels. 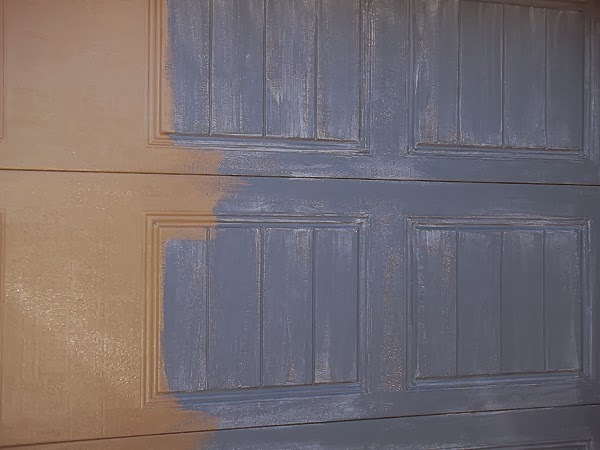 What really helps to create the effect of a rich wood look on the garage doors is that I use 3 colors. The first color is the base coat color. That color is a warm golden light brown (Toasty - SW) and you see that coming through the subsequent 2 layers of brown that I apply. It gives the garage door a warm wood glow. On top of the base coat I apply the first coat of wood tone color. In this case it's Fiery Brown - SW. Then over that I apply a much darker brown that I make by mixing up black with the Fiery Brown. In the photo below you can see the bottom 2 rows have been painted with the first coat of Fiery Brown. The top row is complete and has been painted with the second much darker color brown. 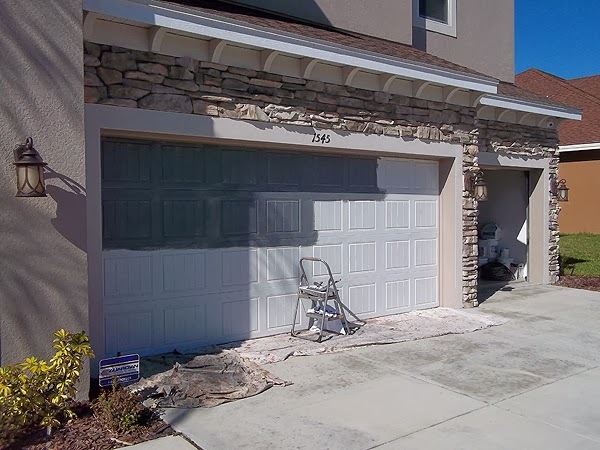 To paint a garage door to look like wood takes time and patience. 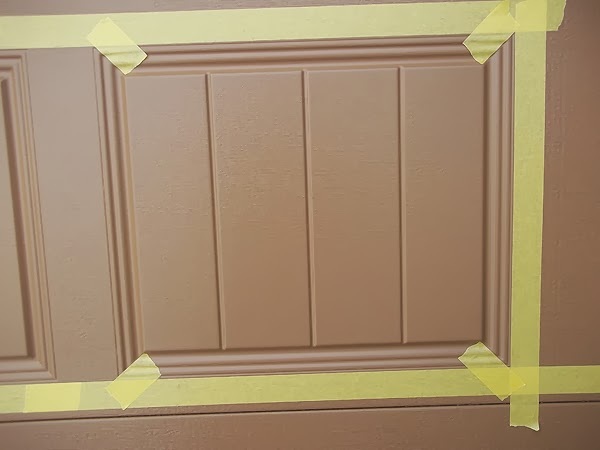 You have to be able to tape off the door properly in order to achieve a professional look. I hope to finish the single garage door tomorrow if the weather holds. I got rained out today at about 1 pm but tomorrow there is no rain in the forecast so I should be ok.